Yesterday I posted a recipe for Gluten Free Chocolate Crispy Cakes, an adaption of the children’s party classic, where I subsituted Rice Krispies for Kallo Organic Wholegrain Breakfast Puffs. 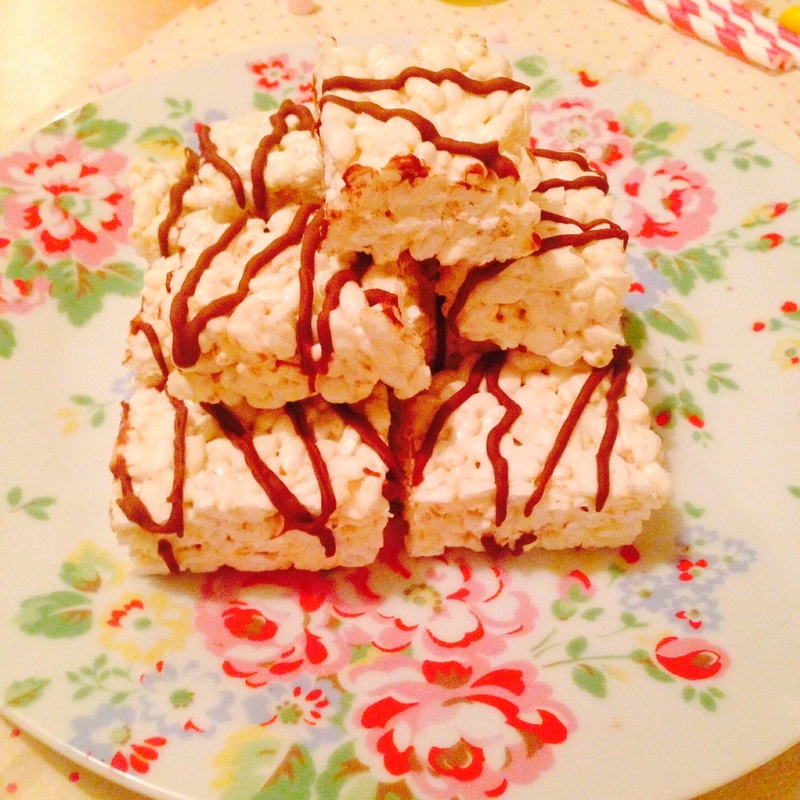 Today I am going to share with you my recipe for Gluten Free Marshmallow Bites, an adaption of Marshmallow Squares, again using Kallo Puffed rice as a replacement for cereal containing gluten. This recipe is lovely and simple, and is easy to whip up if you are short of time. 1) Grease and Line two loaf tins with greaseproof paper. 2) Lightly grease the bottom and sides of a heavy bottomed pan – this will stop the Marshmallows from sticking. 3) Place the pan over a low to medium heat, then add the butter and marshmallows and heat them until they have completely melted. Tip: If the heat is too high the marshmallows will burn, keep the temperature low and make sure you stir them or they will stick to the bottom of the pan. 4) Add the puffed rice and stir until it is fully coated. 5) Remove the pan from the heat and then quickly spoon the mixture into your prepared tins. Tip. It is very important to make sure you have your tins prepared, once the marshmallow mixture has been removed from the heat it start to set very quickly! 6) Level out and smooth the mixture to the sides of the tins using a buttered palate knife, then leave to set at room temperature. 7) Once the mixture has set, use the paper to lift the marshmallow slabs out of the tins and using a sharp knife cut both slabs into 5 long slices. 8) Next, melt the chocolate in heat proof bowl over a pan of simmering water. Transfer the chocolate into a piping bag and pipe a squiggly pattern over the marshmallow slices. If you prefer, you can drizzle the chocolate over the top in a swirly pattern using a fork. 9) Once the chocolate has set, chop all the bars in half to create bitesize treats – or you can keep them as bars if you prefer! If you are feeling more adventurous you can top the bars with sweets or with colourful sprinkles, just make sure you add them before you leave the marshmallow mixture to set.